Ammonium Dose-Reponse Experiment - Applied Marine Sciences, Inc.
AMS and co-PI University of California at Santa Cruz performed dose-response experiments to test the effects of elevated levels of ammonium on phytoplankton isolated from Suisun Bay. Varying concentrations of ammonium were added to pure cultures and phytoplankton were incubated under controlled conditions for seven days. Subsamples for active fluorometry, cell counts, nutrients, and chl-a were taken daily. 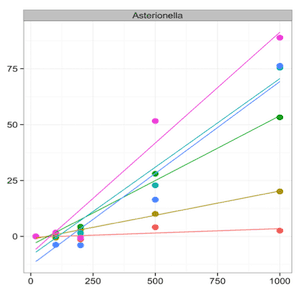 This project provided insights into the ammonium toxicity thresholds for phytoplankton native to the San Francisco Estuary.